The weather today was remarkable. Jilda put a corned beef brisket in the crockpot early this morning and put it on slow cook. She does it every year for St. Patrick's Day. We have corned beef, cabbage, mashed potatoes, butter beans, and cornbread. She normally does colcannon, with soda bread. But this year, my nephew Haven who LOVES this meal, asked if he was invited this year. We'd planned to keep it low key because Jilda has felt well, but by suppertime, we had a house full. Some of the "guests" aren't fans of colcannon and soda bread so we did cornbread and kept the cabbage and potatoes separate. The meal was a hit. Our sister-in-law whipped up a peach cobbler and Haven's wife Alesha baked up a fresh batch of peanut butter brownies. Yum. While the grownups were setting the table, I took the kids out back for a walkabout. Jordan noticed that the pear tree was in bloom and wanted to have a closer look. I shot a few pictures of him an Anthony but they couldn't stand still long enough to get a decent shot, so I took one of the pear blossoms instead. I hope St. Patrick's Day has been good for you too. May you have the "Luck of the Irish" all the days of your life. And to you and Jilda. I hope she feels better soon. 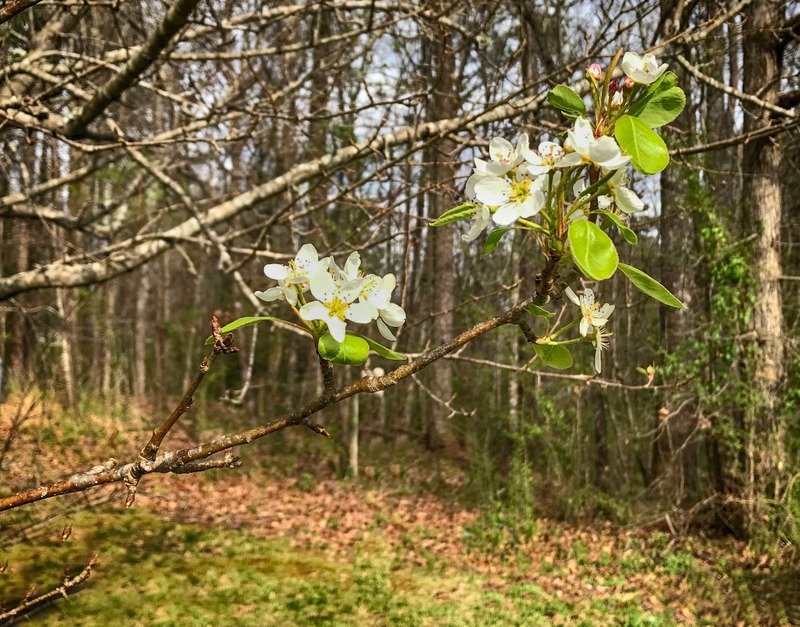 I appreciate the pear blossoms...a reminder for me that Spring will eventually get here...Glad you had a great celebration. Happy St. Patrick's day! When Jilda does make the colcannon I will be there. Lá fhéile Pádraig sona dhuit! The St Patrick Day dinner sound delicious. What is colcannon? Never mind. I'll look it up. lol. Oh my God, I should not have looked it up. You'll have to explain this one to me.